Bunny Rogers, still from Mandy’s Piano Solo in Columbine Cafeteria (2016). Image courtesy of ArtNet. There are a number of artists that use their work to materialize their experience into physical objects to connect with the viewer. In “Inattention” by Bunny Rodgers located at the Marciano Art Foundation, Rogers discusses the mourning of youth. Rather than having feelings of nostalgia for her teenage years, as she stated, she instead uses her work to archive the angst and rage. Using media from her youth, she comments on growing up during the rise of the internet by alluding to events, popular television shows, and prominent celebrities of that time. “Columbine Cafeteria” and “Columbine Library” are Roger’s way of demonstrating the loss of innocence. Referencing the Columbine High School Massacre where 15 lives were taken and 23 injured by two shooters, she describes remembering photos of the blood-stained library and cafeteria televised on news channels embedding the event permanently in the minds of the nation. In her work, Rogers inserts relics from her childhood to demonstrate that it is impossible to compartmentalize and separate these events. Such as in her animated video, “Mandy’s Piano Solo,” she references an episode from the MTV cartoon show “Clone High.” In the show, Mandy teaches other characters the power of friendship and supporting each other in the episode “Snowflake Day.” In Roger’s animated video, her version of Mandy is playing on the piano in the Columbine cafeteria where the furniture is removed and rain from the emergency shower system has turned into snow. By weaving these two experiences together— the broadcasting of the shooting and “Clone High,” she demonstrates that they are inexplicably woven together to form the memory of her youth. Despite the Columbine shooting occurring nearly two decades ago, we still find this exhibition relevant today with the unprecedented number of mass shootings in this nation— this year alone there have been nearly as many mass shooting as days. Time after time, we see a common denominator in these events— mass shooters are predominantly men. This speaks volumes about America’s gun epidemic in relation to our culture of masculinity. Popular media worships men with guns. Think back to every crime-fighting movie you watched in your childhood. Movies praise the male hero who saves the day. He is aggressive, he is resilient, he is strong enough to overcome every obstacle that stands in his path, and yet he is unrealistic. From these classic films, we are laid out a simple formula: manly man uses strength and force to succeed his enemies = high praise. What results is this skewed perception of masculinity that men most must somehow achieve. Similar to traumatic events being embedded into our youth, so are toxic representations of hegemonic masculinity. There are a number of artists that subvert and question these gender constructs in their work, some include Frida Kahlo, Jenny Holzer, Catherine Opie, and Richard Prince. 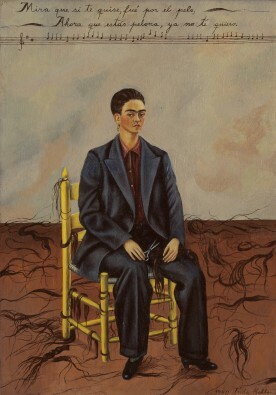 Perhaps the most widely known is Kahlo, who painted self-portraits of herself dressed as a man to demonstrate the fluidity of gender. Holzer’s text-based work is paired with its site to question the location and demographic of each ad. Most notable is her “Truism” series, Raise Boys and Girls the Same, where she displayed the text on a scoreboard in a baseball field to critique the culture of sports and its relation to young boys and girls. Similar to this is Opie’s “Highschool Football” series where she photographed young athletes to explore the community and practice around football, a universally American male sport. Prince became widely popular when he began appropriating imagery from advertisements, like the iconic Marlboro Man, to explore the myth of American masculinity and its perpetuation through mass media. Works like these highlight the notion that masculinity and femininity shouldn’t be exclusive to any specific gender. “Toxic masculinity” is a common term to describe this unhealthy view of masculinity. However, the term “masculinity” is extremely nuanced and yet it’s oversimplified to this singular, heteronormative narrative. Not only are there multiple masculinities but masculinity itself, isn’t inherently toxic— just as femininity isn’t inherently toxic. Instead, our culture’s prevailing model of masculinity is what’s propagating this toxicity. Languages with the vocabulary to express nuanced emotions increases one’s ability to identify these emotions as they arise. Therefore, the more you can recognize these emotions, the easier it is to control and handle your response. Instead of teaching boys that talking about their feelings is a sign of weakness, we should teach them the language to express a catalogue of emotions. By shaming boys we intrinsically isolate them and stifle their ability to form empathy. After all, how can you begin to understand the feelings of someone else if you don’t even understand your own feelings? In the last several decades, we’ve been able to reclaim the concept of femininity, allowing it to become a source of power. And yet, we’ve neglected to do the same for masculinity. This encourages men that strength and power will result in the highest form of success. What results is men abusing their power and using it for tools of exchange— usually in the form of sexual favors from women. Case in point: Harvey Weinstein, Louis C.K., Neil deGrasse Tyson, and Maurice Marciano were amongst the 201 powerful men that were exposed in 2018 for sexual harassment in the workplace. If we want the treatment of women to change, we need to address the way we treat boys. The media that we intake at a young age drastically leaves an impression and forms the basis of our beliefs, ethics, and confidence. Rogers joins the ranks amongst a number of other artists that use their work to demonstrate the importance of youth culture in shaping the identity of the individual.